Researchers from Rice University developed new Li-Ion anode material from graphene nanoribbons (GNR) and SnO2 (Tin Oxide). They are combining the Tin-Oxide with the GNRs and they say that batteries made with the new material has double the storage capacity compared to traditional graphite anodes. Basically to create the new material, the researchers mixed the GNRs with tin oxide particles (about 10 nanometer wide). Using cellulose gum binder and water, they apply the new material to a current collector and place it in Li-ion batteries. In the lab tests, the prototype battery had an initial charge capacity of more than 1520 milliamp hours per gram (mAh/g). After repeated charge-discharge cycles that number began to plateau at about 825 mAh/g. The researchers say that their GNRs can be made in bulk quantities. To make the ribbons they "unzip" carbon nanotubes (CNTs). 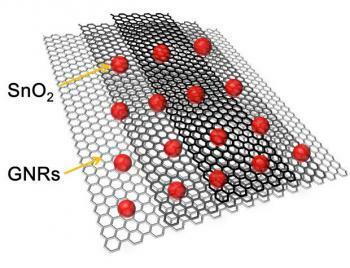 Carbon nanotubes are expensive and they are the starting ingredients for graphene nanoribbons. XG Sciences demonstrates impressive silicon graphene anode material!